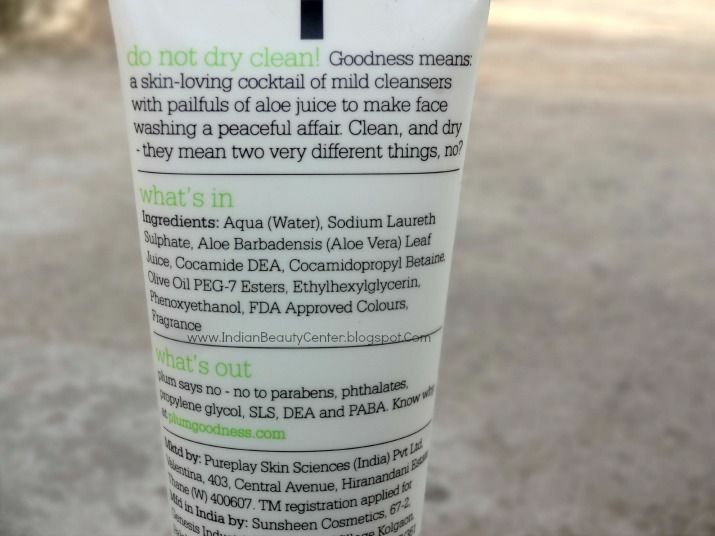 Claims : Goodness means: a skin-loving cocktail of mild cleansers with bucketfuls of aloe juice to make face washing a peaceful affair. Clean, and dry - they mean two very different things, no? A few drops of this wonder are enough to work up a rich, gentle lather that cleans your face without being overenthusiastic about it. Enjoy the freshness of the aloe fragrance that stays long after you're done with washing your face. 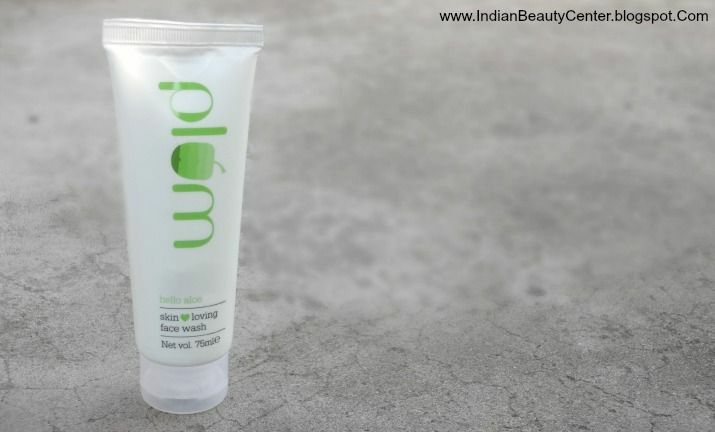 Mild cleansers - no soap or SLS. Real aloe juice. Double check: no drying chemicals. Paraben-free, SLS-free, phthalate-free, as always. Directions for use : Wet face, Lather on skin loving face wash, Rinse off, Smile at mirror, Watch face smile back! Plum Goodness, as you might be knowing, is an online-only beauty brand that makes skin safe stuff like face washes, Angel Eyes Kohl, moisturizers, face scrub, face packs, etc. They do not contain any sort of chemicals that would harm the skin or cause acne. Plum products contain SLES, which is a safer and skin-friendly version of SLS. Plum uses a perfect blend of inorganic and natural/organic ingredients. So, when I read that plums are also paraben, phthalates, PABA, propylene gylcol free, I knew I had to give them a try. So, I started using this Plum Hello Aloe Face Wash and after using this for quite a few weeks, I am ready to review it. This comes in a lovely tube packaging that mentions all the information regarding this product. It also had an outer cardboard box that protected this face wash. I got this product within 3 days of placing my order with free shipping and free cash on delivery. It has a really mild soapy fragrance that I like. The facial cleanser is very runny in consistency and it becomes difficult to control the flow of product. Also, my skin looks much better now after using this mild facial cleanser for my oily skin. I have sensitive, acne-prone skin and thus, I use it as this does not make my skin stretchy and neither breaks me out. However, this does not work for clearing pimples. This is not a face wash that can control acne. So, I use Cipla Saslic Foaming Face Wash along with this to keep my pimples under check. If you have acne then you can also try the Plum Green Tea Pore Cleansing Face Wash that contains glycolic acid for skin. Overall, this face wash has satisfied me completely as it really does its job nicely- cleanses the skin without harming it. My skin looks glowing. Thank you plum for making such brilliant products like this Aloe Vera cleanser! And yes, this leaves no oiliness, dirt or grime behind. It also does not leave any layer on the skin like some face washes do. 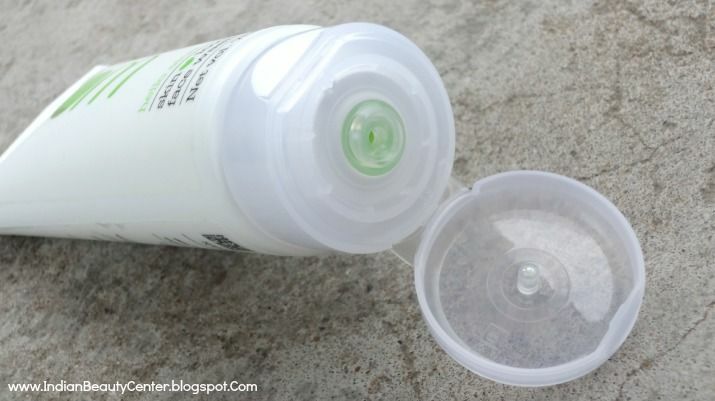 I love this face wash and after this gets over, I would try the other skin cleansers from Plum! Although this is expensive, I am sure it is an investment for clear skin. The quantity is really nice and I need only 3 drops of this for my whole face and neck. Nice review. The look of the tube is so fresh. I didn't know about this brand. Will surely check it out. Nicely reviewed Arpita.. I am soon going to try Plum Goodness..
Great review Arpita.. I'm going to try Plum for sure 'coz they do not have harsh chemicals. New Post - Boho Chic with an old world Charm - Style..A Pastiche!